This trek is to the beautiful Phobjikha valley one of the few glacial valleys in Bhutan, which lies in the mountains east of Wangduephodrang. After crossing over the pass you soon come to the great monastery of Gangtey, established in the 17th century. The village of Phobjikha lies a few kilometers down from the monastery, on the valley floor. This quiet, remote valley is the chosen winter home of the rare black necked cranes, who migrate here annually from the Tibetan plateau. This moderate trek visits the villages of Gogona and Khotokha, passing through meadows and fields, then forests of juniper, magnolia and rhododendrons in full bloom in April. 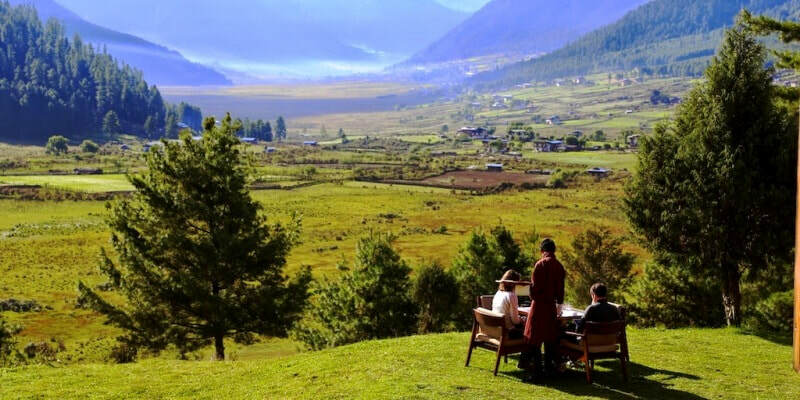 It is one of the finest low level treks in Bhutan. 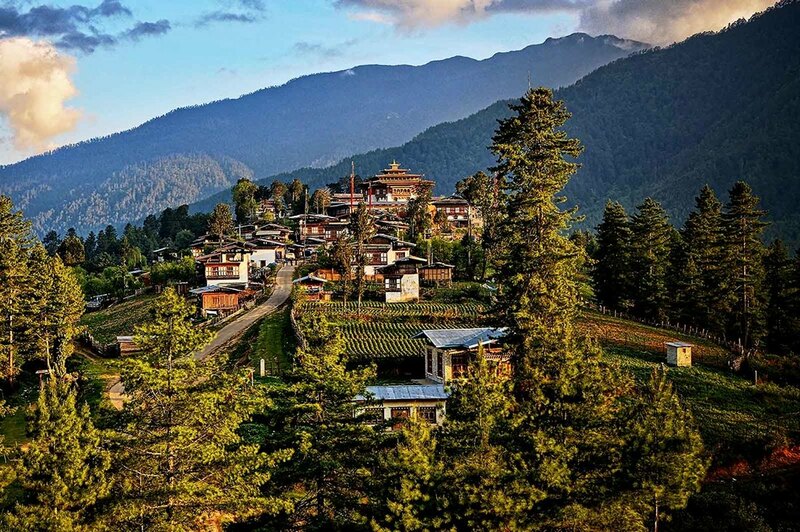 On arrival at Paro airport, you will be met by Bhutan Mindful Travels' representative, and transferred to Thimphu on completion of arrival formalities. Overnight at the hotel in Thimphu. After breakfast, morning tour of Thimphu, visiting National Memorial Chorten, Tashichhodzong, National Ubrary and Institute for Zorig Chusum (generally known as the Painting School), where students learn the 13 traditional arts and crafts of Bhutan. After lunch drive for about 5 hours to Gangtey. En route cross Dochu-la pass (3,088m) and drive by Wangduephodrang Dzong. Overnight at camp/farm house, Gangtey. some time through forests of junipers, bamboo, magnolias and rhododendrons. After a last short climb, we reach Gogona village. The people of Gogona were originally nomads and they speak a language called Bjopkha (language of nomads). Overnight camp. A short ascent takes us to a pass, from which the path descends steeply through ever- changing vegetation till finally reaching the bridge at Wangduephodrang. The trek ends here. Overnight at the hotel in Wangduephodrang. After exploring the attractive Wangduephodrang and Punakha valleys, we drive to Thimphu. Afternoon sightseeing in Thimphu, including visits to the following as time permits: Folk Heritage and National Textile Museums; Handicrafts Emporium; papermaking factory; market. Overnight at the hotel in Thimphu. Morning drive to Paro, en route visiting Simtokha Dzong. Today’s sightseeing in Paro includes visits to: Ta Dzong (National Museum), Rinpung Dzong, Drukgyel Dzong and Kyichu Lhakhang. Overnight at the hotel in Paro.